No one is a stranger to Cuisinart. Their products have been staples in households across the world for decades, and in that time, they’ve made a fantastic name for themselves with their reliability and functionality. They make virtually everything, including wine fridges. The Cuisinart wine fridge rivals some of the best competitors out there, and does so for a considerably lower price. Cuisinart has a number of lines available on the market for the would-be consumer, complete with every feature you may find in more expensive varieties. All that is needed to find the right Cuisinart Wine Fridge for you is to know what role you need your wine fridge to fill. How loud is it? Will it vibrate, and is it heavy? These are great starting points, but it also helps if you know where you want to set up your wine fridge. Will this be a freestanding unit placed on the floor, or something smaller for your counter space? In this article, we try to help you out- hand picking some of the best value wine fridges available from Cuisinart today. With this mixture of reliability, value, and knowledge, you’ll be well on your way to making the right choice for you. The Cuisinart Private Reserve Wine Cellar is the gateway into keeping your wine fresh. 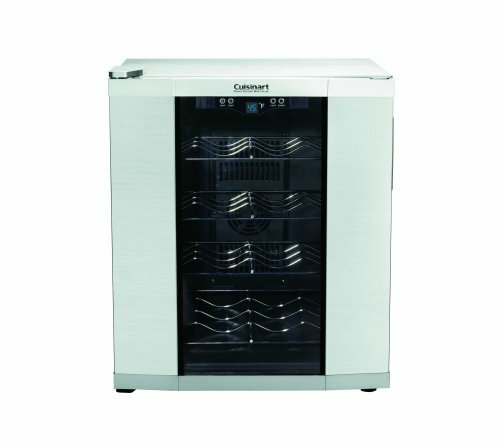 This Cuisinart wine fridge combines a great mix of the latest technology going into climate controlled wine coolers, mixed with an entry level price point, making for a great mix of value, function, and form. This wine cellar uses thermoelectric cooling to ditch the standard compressor, making for reduced vibration and noise in a lighter and more compact frame while using less power to operate. Able to hold up to sixteen 750ml wine bottles, this design features an electronic touchpad and LED display for precise temperature control. Behind the double pane tinted glass door, illumination is provided via simple soft interior lights for easy bottle identification. Four chrome racks provide storage space for the bottles in a climate that can range from 39 degrees to 68 degrees Fahrenheit, depending on your choice, as well as the ambient temperature (more on that in a minute). The Cuisinart Private Reserve Wine Cellar weighs in at only 35 pounds, and measures 16 inches by 18 inches- perfect for a counter or small bar space. And with a height of 21 inches, it will fit underneath most cabinet spaces as well. There are some drawbacks to the Cuisinart, however. Apart from the occasional issue straight from the factory that plagues almost every thermoelectric wine cooler available, there is the issue of ambient temperature. Smaller wine coolers, and especially thermoelectric ones, rely on the ambient temperature outside of the box to help them regulate the temperature inside. This means that if it gets too hot, the Cuisinart can only do so much to keep things cool inside. Assuming your living space doesn’t go above 77 degrees, you should have limited trouble. But keeping this in a warm space is not recommended. Overall, this is a great foray into the entry level of wine coolers, and it is one that should serve you well. We rate Cuisinart Private Reserve Wine Cellar an 8 out of 10 for its combination of price point, storage space, and convenience. The Cuisinart Dual Zone Wine Cellar is a compact wine cooler able to maintain two separate temperatures in different compartments at the same time for your collection of white and red wines. Able to hold up to twelve 750ml bottles, this wine cooler uses a thermoelectric cooling unit for each zone to reduce noise and vibration that is controlled via an electronic touchpad complete with blue LED display, and is able to hold temperatures between 39 degrees and 68 degrees independent of each other. Weighing 40 lbs., the Cuisinart Dual Zone measures 20.4” x 18.6” x 15” and is well suited to a cabinet or bar area, but will be fine on the countertop or inside of a cabinet as well. This Dual Zone Wine Cellar features double doors for easy access to your wine selection, with simple built in soft lights for ease of use when reaching for that next bottle. This thermoelectric Cuisinart has the same issue with ambient temperature as the Private Reserve, and should not be kept in a warm place. With that said, the Cuisinart Dual Zone Wine Cellar does a tremendous job of taking good care of your wine, albeit at a higher price than the Private Reserve. 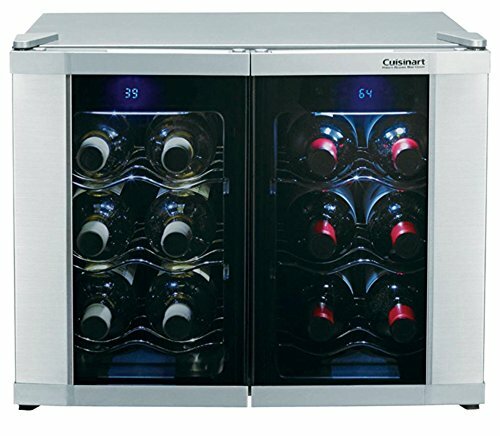 We rate this Cuisinart wine fridge an 8.5 out of 10, and suggest it to the more serious of wine drinkers. For those interested in the entry-level price point of a Cuisinart wine fridge, but are looking for more of a compact beverage refrigerator, we suggest the Danby Designer. The Danby Designer Compact Refrigerator supplies 4.4 cubic feet of storage space for wine or alternative beverages and foodstuffs in a small space that measures only 21 inches by 21 inches, with a 33-inch height. 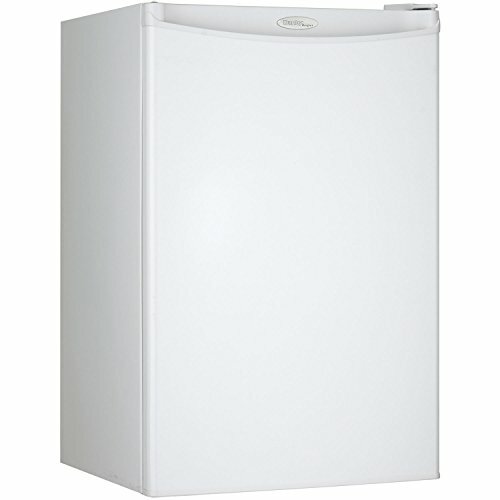 This is a great size for a compact beverage fridge, as it will fit under most cabinet tops, while being light enough to be able to move as need (58 lbs.). While not flashy, the Danby is Energy Star certified, and made of steel for a nice combination of strength and low power usage. Finding the right wine cooler is difficult. We all have different amounts of space available, and we all have different décor and different taste. Known for reliability, sharp design, and low noise, EdgeStar leads the wine cooler industry in both function and quality - we've reviewed their top models. Marvel's combination of high quality components and expert construction has given them a reputation for excellence; here we compare them and recommend one to buy. When it comes to the best thermoelectric wine coolers it's a case of Haier vs Avanti. Let us demystify this decision for you! For when you need to store your wine in optimum conditions, but you only have space for 4 bottles.